We were just passing through Sevilla on our way down the coast, determined to squeeze the most out of this charming city in a couple of days. If you're running short on time, you'll want to be centrally located. The Hotel Alfonso XIII is situated right in the city center, making it the perfect jumping off point for exploring. Best of all, there's a swimming pool tucked away, so you'll have a place to cool off from the hot Seville sun. A bit further from the city center (but still walkable) is the Hotel Mercer Sevilla. With only 12 rooms, this former 19th century palace turned design hotel hits high marks for its expertly decorated lobby bar and rooftop pool. Breakfast in the morning is included and truly delicious. La Azotea is a modern take on tapas and located in the city center in an area overrun with tourist traps. The gazpacho here is thick and creamy and served in chilled terra cotta mugs, perfect for a hot summer day. 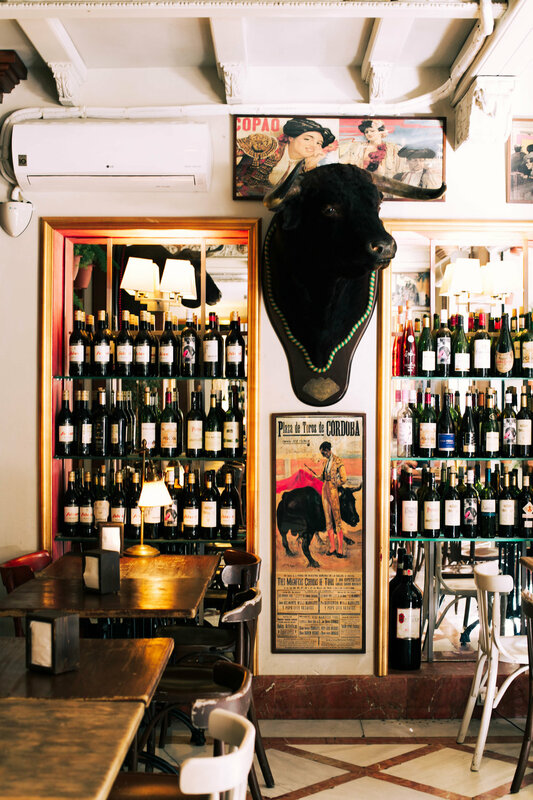 El Rinconcillo has been serving traditional tapas since 1670, making it Seville's oldest bar. The vibe here is buzzy and convivial with an old-school menu. If you're looking for ham, look no further than Cinco Jotas. Well regarded as one of the top producer of jamon iberico, Cinco Jotas has an incredible selection of meats and cheeses, all in an airy, beautifully designed space. Pull up to the bar and feast! Mamaraccha Tapas is a contemporary take on tapas with fusion dishes like Thai salmon tiradito and mini burgers. The space is fun and funky with a "living wall" of floor to ceiling with greenery. Ines Rosales is a great place to stock up on foodie souvenirs, including the traditional olive oil and rosemary "tortas". ENA at Hotel Alfonso XIII offers a great patio for outdoor dining, which is exactly where you'll want to be when the sun goes down. Inside, Restaurante San Fernando offers a more formal setting with a traditional Spanish menu. 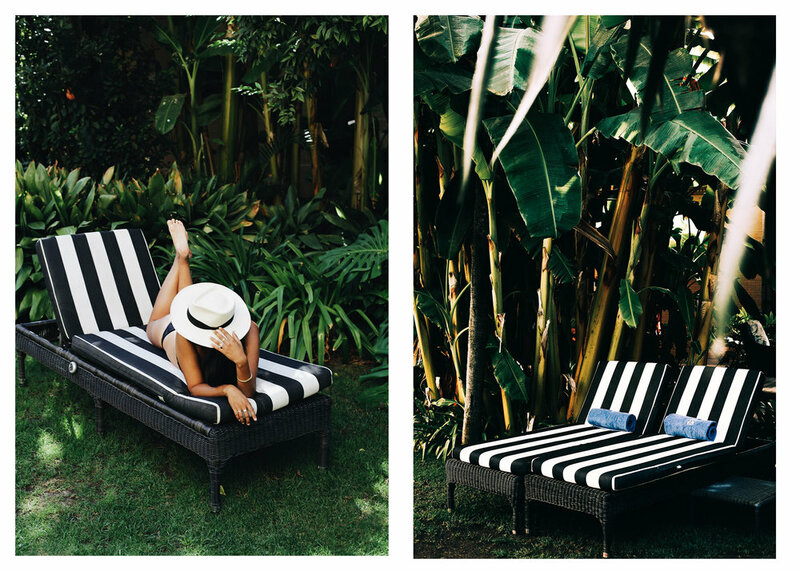 Wearing THIS DRESS, THIS HAT AND THESE SANDALS. 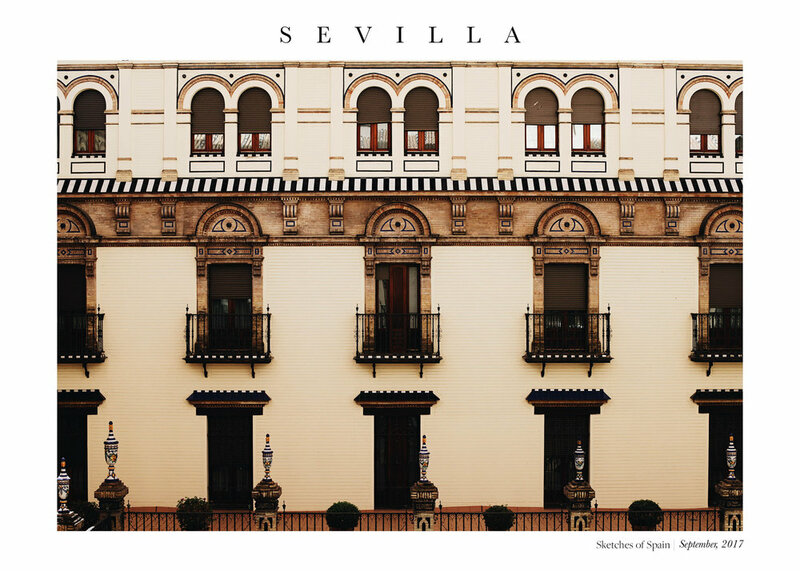 There's a surprisingly long list of to-do items in Sevilla, considering it's size. The Real Alcazar Gardens (of Game of Thrones Fame) is high on the list. An astounding example of Moorish architecture with gorgeous landscaping throughout. History buffs will also enjoy touring the Jewish Quarter (Barrio Santa Cruz), Casa de Pilatos and Plaza de Espana with it's stunning tile work.